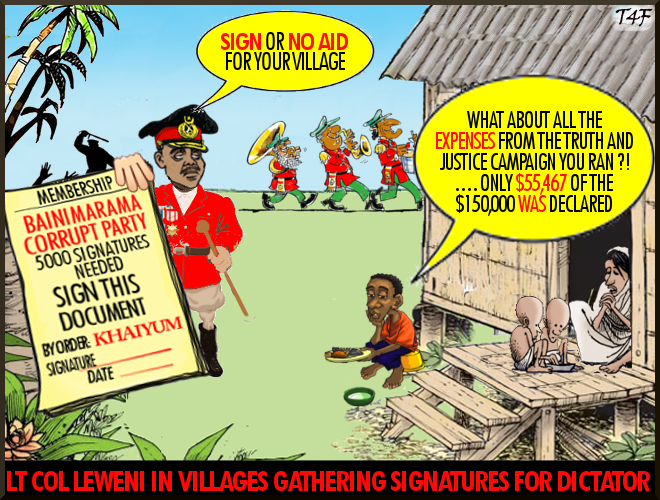 FijiLeaks reports that the highest ever ranked Military Band Master, Neumi Leweni, is visiting villages in an attempt to collect 5,000 signatures needed to register the dictator Bainimarama's corrupt party. In 2006, Leweni provided receipts to the Auditor General for only $55,467 of the total $150,000 that was "supposedly" spent on the Truth and Justice Campaign, against Fiji's last democratically elected Prime Minister, Mr Laisenia Qarase and his party. $94,533 still remains unaccounted for. Reliable sources within the military reported that Bainimarama had used the money on alcohol and entertainment for himself, his family and friends. Hence no receipts will be provided. The Auditor General is also banned from reporting on any corrupt practices or wrong doing by Bainimarama and Khaiyum and their junta. The Truth and Justice Campaign was a joke, aimed at making Mr Qarase and his government appear corrupt so that they would lose support. But Bainimarama's nasty and evil plan backfired with more indigenous Fijians giving their support to Mr Qarase's SDL party.